Canna lily is one of the erect, exotic, robust, rhizomatous and perennial bulbous flower. Canna x generalis is the botanical name given for the canna lily. The word ‘canna’ is originated from the Latin word meaning ‘cane or reed’. It is the only member belonging to the Liliopsida class(monocot group) and the only genus belonging to cannaceae family. It has only one genus i.e. canna and has around 10 to 100 species. The hard and impenetrable covering of the seed makes it possible for the seed to hibernate. It is considered as one of the most colorful summer bulbs that produce red, pink, yellow, orange and white colored flowers. It is native to tropical and sub-tropical environments of the New World. It grows well in full sun, open marshes, lake margins, ponds, savannas, shallow water, ditches and pine flat woods. Description: Canna is a tropical and sub-tropical perennial plant with rhizomatous rootstock. The tropical appearance of this plant serves as the best showcase. Canna lily grows well in sandy, loamy and clay kind of fertile soil. It grows from an underground stem called rhizome that contains the most amount of starch among all the plants. Thus, this plant is regarded as the agricultural plant. It requires full sun light. Early spring, summer and fall (frost) are the blooming time for this flower. The plant relishes hot and humid weather. It produces the most colorful bloom. The plant is commercially grown in Asia, Latin America, India, Australia and Africa for the production of starch from the rhizome (edible). 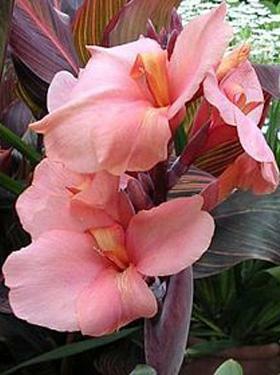 Flower: Canna has very flamboyant colored flowers of red, pink, orange, yellow and white color. The hybrid of this plant produces varied colored flowers. It is composed of three sepals and three petals. The petals and sepals are hidden under the conspicuous stamens, thus, they are often not noticeable. The stamen bears pollen from a half-anther. The attractive nature of the flower pulls pollinator such as bees, hummingbird, sunbird and bats making easy pollination process. Leaf: Canna lily has veined and paddle-shaped leaf. The leaf is flat and broad growing out of a stem. The leaves usually come in solid green but maroon, purple, brownish and variegated leaves are also possible from this plant. The foliage is large and attractive. Scientists have found it to have the richest starch amount. Planting: Canna is a tropical plant but it is also possible to plant it in temperate environment as long as it receives 6 to 8 hours of sunlight during the summer months and are moved to warmer place during the fall. Cannas have low maintenance and are easy-to-grow kind of plant resulting in long lasting, attractive flowers and leaves. Looking after canna is not a tedious task. It can be propagated through seed or They can be planted through seed or rhizome. It can be planted in small pots inside the house and also outdoors during the early summer months. They grow best during the month of September and October when almost all the other flowers have reached their peak. 1. Loosen the soil up to 12 to 15 inches and then mix the soil in 2 to 4 inch compost. 2. Set the bulb with eyes up in 2 to 3 inches deep soil. 3. Water thoroughly for the easy growth of the bulb. 4. Make sure that the bulbs are 1 to 4 feet apart. 5. Make sure that the plant receives excess amount of sunlight (6 to 8 hours). 6. The plant will start blooming in 10 to 12 weeks. Care: Cannas grow best with the supply of good amount of water. So, make sure that the plant is watered well. Once the flowers start fading away (the bloom stops), cut down the stem carefully. With the arrival of autumn frost, it is best suggested to lift the bulb from the soil for winter storage. The rhizomes are frost tender and may rot if not kept in a dry container. During the storage time, make sure that the bulbs are not touching each other and are kept in a moist-free environment such as attic, basement or in crawl spaces inside a plastic bag or a clean cloth bag at around 45 to 50 degree F. It is best suggested to plant this plant only after the threat of frost has fully passed. During the spring time make sure that the bulb is cut with a sharp knife, there must be an eye present in each cut part of the bulb. Fertilize the plant monthly with rich amount of phosphate for a long lasting bloom. Pest: The plant is often attacked by spider mites, slugs, snail and caterpillars. These insects mainly attack the leaf and make holes in the leaf. Cannas are usually disease free but they sometimes get attacked by some virus and bacteria. A fuzzy mold called botrytis often attacks the fowers. This condition can be avoided by the timely removal of the old worn-out flowers. Canna rust leads to orange fungal leaf spot. Bacterial blight etc are also seen as problem for the proper growth of the plant. The plant may sometimes get attacked by virus leading to twisted branches, streaked leaf and distorted blossom. Origin: The first species of canna introduced in Europe was C. indica L. The plant was exported from the tropical of America called the Western Indies. It is from Western Indies that the plant got its name as C.indica L. Canna is solely an American genus exported to the other parts of the world. The early species of canna grown in India and Africa were also introduced from Southern and Central America belonging to C. indica and C. glauca. The hard covering of this seed have made it possible for the long voyage and have been grown from antiquity. The plant has long been cultivated as a food crop in the Central and South America around 4000 years ago. Distribution: This eye-catching tropical, sub-tropical plant is native to Cuba, New World (southern U.S) and south to north Argentina. This plant has been found invasive in South East Asia, Queensland, Pacific Islands and South Africa. They are famously grown in almost all the tropical areas of the world where the plant can receive 6-8 hours of sunlight. They grow up to 2-3meters tall but the size varies accordingly. It is possible to propagate the plant through seeds or through the vegetative propagation. Habitat: This plant grows well many environments. It is commonly grown in thickets, wet forest, along roadsides, in villages, clearings, in forests, near streams and in low moist areas. Basically the plant grows well in places that receives much amount of light and has a tropical to sub-tropical environment. Environment: Cannas grows well in various tropical and sub-tropical climates where it receives rainfall of 1000-1200 mm with the availability of sandy, loamy soil rich in humus. The plant grow in the normal temperatures above 10˚C, it can also tolerate high temperature of 30˚C to 32˚C. Pollination: Cannas are capable of self pollination but outside pollinator such as insects, nectar consuming birds such hummingbirds etc. All cannas produce nectar and are attractive enough to attract birds and insects towards them. The pollen gets transferred from the stamen to the stigma for the production of canna seed. Reproduction: Reproduction of calla lily is mostly done through the rhizome (bulb). The rhizome cutting gets harvested in 6-8 months after planting. Reproduction through seed is rarely done but it is possible in case of diploid form. Uses: This plant has well proved to be beneficial in both social and economic point of view. It has a number of positive impacts leaving its invasive nature aside. This broadleaved, herbaceous perennial plant has lots of uses. In Thailand, canna is used as a traditional gift for the Father’s day. Canna can be used in herbaceous borders, tropical planting and also as a decking plant. The plant serves as the garden ornament. The plants are planted in the highway for natural beauty and attraction. The eye-catching color of the canna serves as attractive borders in the garden. The smooth, hard and blackish to dark brown seeds of canna lily are used for jewelry making and also in making musical instruments. They are used as garden plants in making the house appear attractive and nature-based. Horticultural industry depends upon this plant for large production. The rich starch present in the rhizome is used by humans and animals. The leaf and stem is used by the herbivorous animals as fodder. The fiber produced from the stem is a substitute to jute. In the remote areas of India, the canna is fermented to produce alcohol. The fiber produced from the leaf is used in the production of light brown paper. We obtain purple dye from the seed. The smoke obtained from the burning leaf is used as an insecticidal. They look attractive in container and are used in decoration of rooms, garden, and also for some background attraction. Almost all the parts of canna is eatable leaves, roots, seeds and stem. They all are eatable. Andes, Southern China and Peru uses the starch produced from the canna rhizome in making cellophane noodles. The rhizome can be turned into flour through peeling, drying and milling. Canna Indica is most commonly used in food production. Canna has numerous medical uses: the rhizome extract is used in curing acute hepatitis, traumatic injuries, diarrhea and also helps in controlling nose bleeding.